Saxophonist Eddie Barbash attended the Vail Jazz Workshop in 2005. If you have watched late night TV any point over the past two years chances are you’ve seen Jon Batiste and Stay Human, the house band for The Late Show with Stephen Colbert. 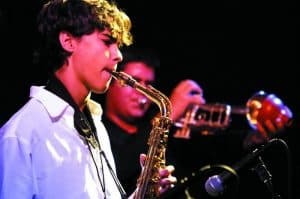 The band has had several Vail Jazz Alumni sit in for shows over the course of its tenure including Grace Kelly (’08), Russell Hall (’10), and Patrick Bartley (’10). The most frequent Vail Jazz Alum seen in Ed Sullivan theater was Eddie Barbash (’05), one of the founding members of Stay Human. Alumni CD Releases 2017 Meet the 2017 Vail Jazz Workshop Young musical talent is about to be amplified At Vail, Stellar Jazz Faculty Fosters Exceptional Young Talent (Downbeat Magazine) Preorder your 2017 Vail Jazz Workshop CD today!